On the last page of the issue is the report that the train carrying the body of Charles Walsh to San Diego would be stopping at Albuquerque. Walsh was an aviation dare-devil who died just a few days earlier when his plane crumbled mid-air and crashed to the ground. 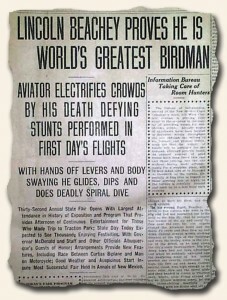 Walsh had appeared at this fair the year prior performing aerial stunts … ironically Walsh was trained by Beachey. The Traveler… it does what?… make them stop!!! Today I made a return trip to Carlisle, Pennsylvania, via the Valley Sentinel from March 19, 1912, where I found Frank Coffyn had an aeroplane which was able to not only fly, but swim and crawl! 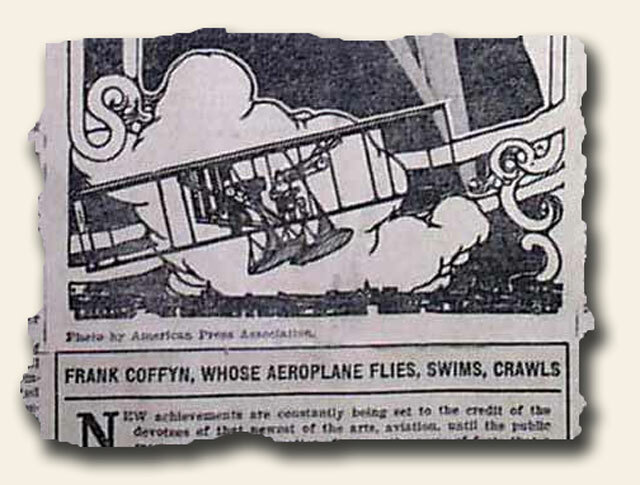 It had also been used to take aerial photographs of the islands and shipping harbors of New York City. With the fitting of aluminum pontoons, it enabled the plane to float on the water and power along the ice floes in the Hudson. In researching Mr. Coffyn, I found that Wilbur Wright invited him to Dayton, Ohio, where he began flight instruction in 1910. 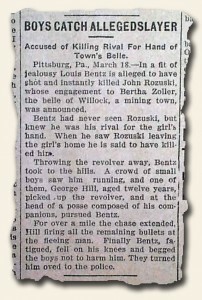 Another article is one in which Mr. Bentz had instantly killed Mr. Rozuski out of a fit of jealousy over an engagement. After the shooting, Mr. Bentz threw the revolver away. 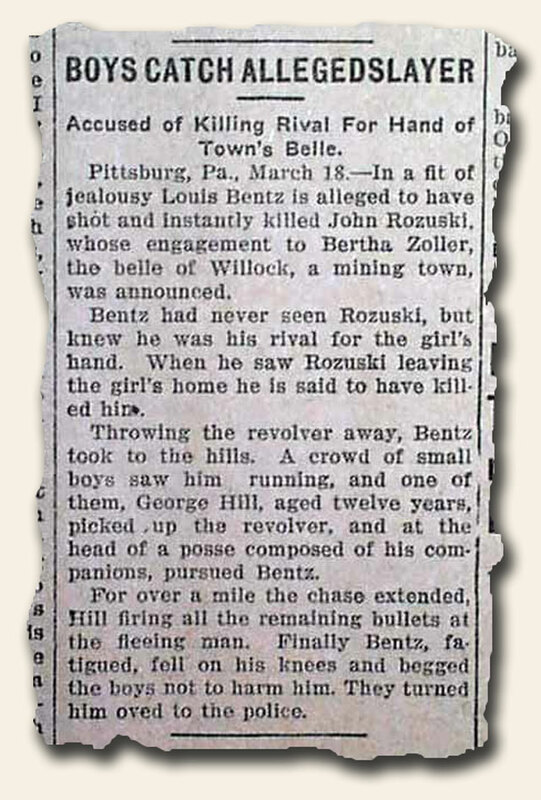 However, a group of small boys saw him running away… and a 12-year-old, acting as the head of the young “posse”, picked up the revolver and pursued Mr. Bentz for over a mile while firing the remaining bullets at him. Finally, the fatigued Mr. Bentz fell to his knees and begged them for no harm. They turned him over to the police. This almost sounds like a scene from the “Lil’ Rascals”! As this year draws to an end, I traveled back 100 years to December 31, 1910. The Christian Science Monitor that day contained a variety of articles on the front page from aeroplane flights records being broken to Chicago having a record in new buildings to the fall off in Alaska gold production to the discovery of a new star! A nice automobile ad is also present. However the article that intrigued me most was of “Taft Greeting to Army and Navy.” It had been a New Year’s custom for the officers stationed in Washington to call on the President as commander-in-chief, however there would be change this year. President Taft had arranged to have telegrams or cablegrams sent to every navy yard, naval station, army post, fleet or detached vessel he could reach. The message was brief, but was a Presidential greeting sent around the world. Wishing a blessed New Year to you and yours.